Kevin Kayle (KK) started the presentation by giving a history of Ohio trout program, focused on rainbow trout and brown trout. Three hatcheries are involved in trout stocking in Ohio; Castalia, London, and Kincaid State Fish Hatcheries (SFH). Rainbow trout are raised at all three hatcheries and brown trout only at London. The Division of Wildlife (DOW) has made significant investments at all three of these hatcheries to improve our trout production capabilities. Capital improvements at these hatcheries include $2,500,000 at the Kincaid SFH (completed in 2009), $7,000,000 at Castalia SFH (completed in 2012) and $1,500,000 at London SFH (completed in 2015). The DOW no longer hold brood stock for eggs. Rainbow trout eggs come from Troutlodge in Washington. Eggs are delivered to London in January and Castalia in March. Brown trout are delivered to the London SFH in November from the United States Fish and Wildlife Service, Saratoga National Fish Hatchery (in Wyoming). After eggs are given an Iodine bath to kill any disease organisms, the eggs are placed in Heath trays, at approximately 10,000 eggs per tray. Yolk sac fry hatch from eggs and sustain themselves with the yolk for first few weeks. After day 14, they need food; food size increases as fish grow. Fish are initially fed a prepared fish diet at 4‐6% body weight per day, which is progressively reduced to 1‐2% body weight per day. Rainbow trout eggs are received in January and are stocked as catchable‐ sized fish 13‐16 months later, in April or May. Brown trout eggs are received in November and those fish are stocked as (yearling) fish the following October, after approximately 11 months in the hatchery. Rainbow trout were first stocked in the 1940’s. A total of 155 locations were stocked through the years as adults, catchables, yearlings and fingerlings. Brown trout stocking began in the 1950s. Through the years, brown trout have been stocked at 30 different locations as adults, yearlings, and fingerlings. Both species were stocked by trial and error. In the 1970s ‐1990s streams were evaluated before trout were stocked. Criteria for evaluations were ecosystem, existing fish species, water quality, growth, survival, and harvest. It was also recommended at this time that rainbows be used for a Put-and- Take fisheries and browns be used to create Put-Grow-and-Take fisheries with separate regulations for each species. In the 1990s Castalia SFH was acquired by the state and the number of coldwater fish species that could be produced increased greatly. A stream evaluation study was conducted with criteria being water temperature, habitat quality, ecosystem, public access, proximity to the public, ecosystem and existing fish. From that study, 3 streams fit the criteria, the Mad River, Clear Fork and Clear Creek. The Mad River had been stocked since 1974. Stocking of brown trout was started in the Clear Fork in 1995 and in Clear Creek in 1997. Brown Trout Program Overview: Management Richard Zweifel (Acting Inland Fisheries Program Administrator). There are three tools used to manage trout in Ohio: stocking, assessments and research, and regulations. Rainbow and brown trout are non‐native to Ohio and stocking is only way to provide fisheries. Catchable rainbow trout are a Put and Take fishery; 116,000 fish are stocked into 66 small lakes every year to create short‐term fishing opportunities. Brown trout is a Put, Grow, and Take fishery; 25,000 fish are stocked at 500 fish / river mile in 3 streams. Assessments include collections of both fish population and angler information. No assessments are done on catchable rainbow trout fisheries, because we don’t expect those fish to be in the system long. A research study was recently completed on brown trout to assess survival, growth, and movement. Ethan Simmons (ES) presented some results from this study later in the meeting. There are three ways to collect information on angler opinions and preferences, creel surveys, online surveys, and angler summits. A creel survey was just completed on the Mad River in 2016. This survey provided information on angler use, catch and harvest, and angler demographics, opinions, and preferences. Tim Parker (TP) presented the results of this study in the next segment of the meeting. An online survey of trout anglers was also conducted in fall of 2015. These results were also presented later in the meeting. The regulations used to manage put‐take rainbow trout fisheries and put‐grow‐ take brown trout differ. For the catchable put and take rainbow trout‐ there is no size limit and a 5 fish per day daily bag limit. Because no survival is expected, these trout are stocked to provide opportunities for anglers to catch and harvest fish; we want anglers to harvest these fish. The put‐ grow‐take management approach for brown trout differs from the catchable rainbow trout program. The 2 fish per day, 12 inch minimum size limit regulations are intended to prevent overharvest, especially of small fish before they have an opportunity to grow to sizes that are desirable to anglers. The goal is to create a brown trout population comprised of a broad range of sizes, including some larger fish. We are dedicated to continuing to maintain a quality trout program. The Ohio trout program has come a long way in 60 years through research, assessment, stocking, regulations, and angler inputs. Questions: What is the feeling of holding capacity at Mad River per mile? Rich Zweifel (RZ): Recent research shows that the current stocking rate at 500 fish/mile may be pushing the limit of these systems. Growth rates of brown trout are not as good as expected. Can numbers improve with improved habitat, lunker structures, etc.? Marty Lundquist (ML) and ES: There are a lot of fish in system now. That might have some effect in localized areas, but likely wouldn’t improve the population of the entire river very much. Slow growth indicates that there are a lot of fish in system. What is capacity of upper Clear Fork? Ed Lewis (EL): In the upper CF, fish are moving into the colder areas where they have good groundwater. Good groundwater is where you have fish. It is at capacity. For Mad River there is habitat in water, plenty of structure in water at 200 cfs cuts and rootballs there. Stocking 500 fish/mile because of habitat and food in stream at assessment, seems to be plenty of food. I think the river can handle more fish. I think there is plenty of food, they do assessments, every rock has food attached to it. Where are we getting evidence that there are too many fish in Mad River? RZ: Many fish leave system after we stock fish in October. When we sample in February many older fish are gone and have been replaced by the recently stocked fish. The growth rates are slower than expected. Where do we sample? ES: Winter and summer assessments. Sample transects 0.3 miles long. River stratified into 0.1 mile transects; transects to sample are randomly picked and each 0.1 mile transect above and below picked transect also sampled for one sample. ￼ Why not sample bridge to bridge? ES: Random sampling allows us to sample all habitat types within the river with less effort. We do not have enough manpower to sample the entire river. If stocking 500/mile is pushing capacity why do some areas have no fish and others do? We don’t have fish in all habitats. RZ: The fish go where they can make a living. If a stretch of river is not good for fish, there will be no fish there. Fish move a lot, distribute themselves where they can live and have the best chance of surviving. Habitat, temperature, and prey conditions dictate where fish will spend their time in a particular stream. Brown Trout Research Ethan Simmons (Fisheries Biologist, District 1 Office) From 1997 – 2010 the Division of Wildlife stocked over 500,000 brown trout with little assessment. In 2011 a four year project was started to look at survival, growth, and movement in the Mad River, Clear Fork and Clear Creek systems. The project was intended to gather information on survival, growth, and movement of stocked brown trout and to determine if current management approach was appropriate for all three program streams. Fifty percent of brown trout will die if exposed to water temperatures of 76F for 7 days. We assessed the thermal conditions of our 3 trout streams by placing temperature loggers in each that collected temperature every 30 minutes all year. The number of trout in each system was assessed using electrofishing. Brown trout survival in Clear Creek was variable but generally low. During hot summers, fish likely died from warm water but in cool summers, some fish survived. In the upper Clear Fork survival was more consistent, with fish able to find enough cool water refuges to survive. The lower Clear Fork had 2 years where no fish were sampled during summer surveys. The Mad River had the highest abundance of fish, and no days when water temperature was above the lethal limit for trout. Overall the Mad River and Upper Clear Fork can support the put‐grow‐ take management approach for brown trout. The Lower Clear Fork and Clear Creek do not support trout during hot summers. During mild summers these systems can support trout but there are not enough cool water refuges to support many fish. Brown trout in the Mad River ranged in size from 4 ‐ 25 inches with an average length of 10 inches. Thirty nine percent of the trout were above the 12 inch minimum length limit for harvest. Only 1% of age 2 fish were longer than 12 inches, so most trout need to be in the river for 2 years to reach 12 inches. In Clear Creek no trout were ever sampled over 12 inches. In the upper Clear Fork, 8‐29% of trout were over 12 inches. In the lower Clear Fork 1‐11% of trout were above 12 inches. Water temperature determines trout survival and, therefore, the size distribution of trout in these systems. We conducted this research to determine future of brown trout management at these locations. The put, grow, and take approach works in Mad River and upper Clear Fork, but is not an effective approach at Clear Creek or the lower Clear Fork. Questions Are a few tributaries stocked? ES: Mac‐O‐Chee gets 1,000 trout stocked in it. Other tributaries not stocked anymore due to low water. All stockings have been moved to the mainstem of the Mad River. Are fish being replaced or moved out? ES: Percent of age 2 fish declines after stocking. Sampling 3+ miles of stream every year. In Mad River, fish survive in summer and fall. Stock fish in October and 3 months later stocked fish replace larger age 2 fish. Maybe stocking too many fish and overwhelming the system. Ten to twelve inch fish are being replaced by 8 inch fish. Comment‐ Age 3 fish more abundant than age 2 fish so age 2 fish may not be as catchable. Brown Trout Angler Opinions, Attitudes and Preferences Richard Zweifel An online survey was made available to collect angler opinions on steelhead, catchable rainbows, and brown trout. This information can be difficult to collect from anglers that fish for other trout species. With the Mad River creel, only the opinion of a small cross section of brown trout anglers could be collected. The logistics of interviewing anglers during a creel survey are difficult, trout anglers spread throughout the stream, and there is generally low fishing pressure. A creel survey is best to collect information about effort, catch and harvest but only limited opinion and preferences data can be ￼ collected. The online survey allowed us to get information from a much broader section of anglers statewide. Anglers were able to take the survey 24 hours a day, seven day a week. It was relatively easy for anglers; the survey takes 46 seconds to 16 minutes to complete depending on how many species an angler fished for. Easy for us to collect and summarize the data. We surveyed all 3 groups of trout anglers, steelhead, catchable rainbow trout, and brown trout anglers, and collected information on use and participation, and opinions and preferences for each group. Only Brown Trout angler information was presented at the meeting. The online Survey was open from September through October 2015. Respondents could take the survey for one species or all species. Twenty six percent (240 anglers) took the Brown Trout survey. Of the 240 anglers, 96% were male and 55% less than 50 years old. Most anglers fished only one stream. Where did they fish? Number of Anglers Clear Creek 29 Upper Clear Fork 22 Lower Clear Fork 39 Mad River 99 Multiple streams 30. Average number of days spent fishing for brown trout? Clear Creek, Upper Clear Fork, Lower Clear Fork, Mad River, Multiple Streams 5‐16 days, 6‐28 days, 2‐11 days, 5‐20 days, 3‐18 days Harvest not considered wide spread. Ninety percent never harvest a trout. Upper Clear Fork anglers were the most satisfied and Mad River anglers were the least satisfied. Percent of Anglers Satisfied with Size of Trout Being Caught Percent approving the 2 trout per day bag limit ranged from 77 to 90%. 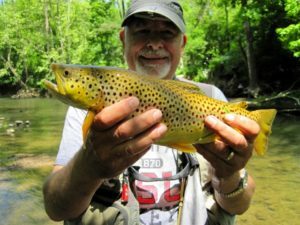 Anglers that fish the lower Clear Fork and Clear Creek believe trout should continue to be stocked there even if water temperatures are lethal to trout some years. Upper Clear Fork and Mad River anglers thought it was ok to discontinue stocking trout in lower Clear Fork and Clear Creek. We got the opinions of 240 brown trout anglers and were able to collect stream‐specific data. In addition, the opinions of trout anglers that do not belong to a trout club were heard. Only trout club members are invited to summits because the Division has no contact information for non‐club members. ￼￼￼Stream ￼￼Not Satisfied, ￼Neutral, ￼￼Satisfied: ￼Clear Creek ￼￼18 ￼57 ￼25, ￼Upper Clear Fork ￼￼35 ￼45 ￼40, ￼Lower Clear Fork ￼￼19 ￼53 ￼28, ￼Mad River ￼￼17 ￼￼57 ￼￼26. This summary does not include discussion specific to the Mad River brown trout fishery or the rainbow trout stocked in lakes.